I know that Terrell Owens is all drama. I know that he’s a “crybaby.” Hell, we’ve even used his “crying picture” here at When T.O. broke his leg prior to the 2004 Super Bowl he had to find a new way to stay in shape. If you recall, he had to drag himself back in time for the big game. Many people questioned if he would be ready to play. Even though he wasn’t 100% he was able to play in the game, and we all marveled at his toughness. Well, part of that recovery was due to resistance bands. Instead of using free weights his trainer put T.O. on a regimen that included resistance bands. When he saw the results Terrell never left the resistance bands. Today he’s even teamed up with a company called Terrell’s routine doesn’t swear off free weights, but his use of resistance bands is so unique that you could make up and entire program of nothing but resistance band exercises. It should also be noted that you really do need a break in between these exercises. Terrell jumps rope between the exercises because he is crazy and in very good physical shape. You should use your better judgment before attempting to do a workout exactly the way he does it, but if you are willing to push yourself you will see fantastic results. Resisted Crunch: 2 sets of 30 reps each. Standing Ab Twist: 2 sets of 20 on each side. It’s after this exercise that T.O. jumps rope for 30 seconds. He jumps rope for 30 seconds after every exercise in the rest of this set. Lunge: 4 sets of 30, 28, 26, and 26 reps respectively. Remember, you have to do 4 sets on each side. Then this maniac jumps rope for 30 seconds, again! Standing Calf Raise: 4 sets of 20 reps. Standing Upper Back Row: 4 sets of 12 reps. This may not seem as “fancy” as lifting free weights, but an upper back row with a resistance band is hard work. Seated Floor Back Row: 4 sets of 10 reps each. Shrugs: 4 sets of 11 reps each. Seated Two Arm Triceps Extension: 4 sets of 13 reps each. Remember, this is just the first day of Terrell’s routine. You could easily just do this and be very happy with yourself. If you want to get more intense perhaps you could add his “day two” to your regimen. Kneeling Ab Crunch (ankle straps): 3 sets of 25 reps each. Laying Two Legged Hip Flexor: 2 sets of 3o reps each, then he jumps rope for 30 seconds between exercises–just to make it interesting. Standing Calf Raise: 3 sets of 3 reps each. Two Legged Hamstrings Curl: 4 sets of 11 reps each. Standing Two Arm Chest Press (Low): 4 sets of 15, 14, 13, and 13 reps respectively. Standing Hammer Curl: 3 sets of 15 reps each. Standing Biceps Curl: 3 sets of 10 reps each. Body Weight Lunge (without the bands): 6 sets of 15 reps on each side. Once again, keep in mind that this is just “day two.” I think I’d be crying at this point, but if you want to move on to “day three” then be my guest. In my opinion, the easiest way to intensify this workout is to continue with days three, four, and five. Doing these exercises on consecutive days builds endurance that you can’t get in many other places. Pushing yourself through an intense series of exercises that seem simple can offer some nice results. Also, you don’t have to go through a “cycle” if you don’t want to. You could do just “day one” a couple days a week. If you’re trying to “get big” then maybe a workout like “day two” is your “off day” because you’re a big, hulking monster already. Either way, you can find a place for the resistance band workout in your routine. 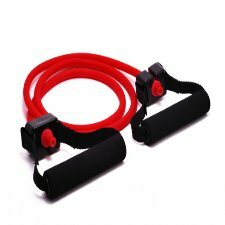 Remember that resistance bands travel well so you will, basically, never have an excuse to miss a workout ever again. Business trips, visiting grandma’s house, or even a weekend in Vegas can’t stop you from exercising. This is the beauty of the resistance band. You are never far from a workout. Plus, it’s a workout. Some of you hate the idea of running–so do I–and you have no desire to start running just because it’s “portable.” Sit-ups and push-ups are the same thing. Some of us, including me, don’t want to do those either. There are over 140 individual exercises you can do with resistance bands that will help you tailor them to your needs. It doesn’t mean you have to T.O.’s workout, but you can if you’re crazy. Try the resistance bands and they might become your new best friend. It worked for Turrull.